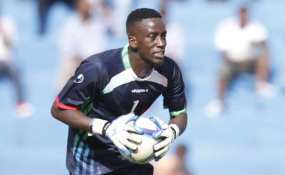 Kenyan-born goalkeeper Arnold Origi on duty for Harambee Stars during a past international match. Origi joins his new team from Norwegian club Kongsvinger following the expiry of his contract early this year. "I didn't really know anything about HIFK, but Tor (Thodesen) contacted me and told me that HIFK needs a goalkeeper so I went online and checked and what I saw impressed me. (This is) a team with a long history and fantastic supporters. I want to know more about the club so I was in contact with the association," said Origi. Origi's coach at his new club also had very pleasant things to say about his new signing. "I know Arnold very well. He played for me in Moss FK in the year 2011. He is a purposeful person and a professional who works hard during every match and training. Arnold has made a name for himself in Norway, first and foremost through his five season in Lillestrom," said Helsingfors coach Tor Thodesen. Helsingfors is the oldest club in Finland having been formed in 1987. It earned promotion to the country's top flight in the 2015 season. Origi, son of former Gor Mahia and Harambee Stars captain, Austin Odour, won 38 caps for Kenya and will be hoping to make a mark at his new club, starting with the opening league match away to SJK on April 3.